At the point of injury, the concussion epidemic begins with the neurometabolic cascade. We address this root cause of the short and long term concussion symptoms to ensure patients get better faster and healthier. Dr. Ruben St. Laurent is a concussion doctor who addresses mild traumatic brain injuries (mTBI) with a compassionate heart and medical research following the NEI protocols. Over 100 articles from both basic science and clinical medical literature selected for relevance to concussive brain injury, postinjury pathophysiology, and recovery of function. The primary elements of the pathophysiologic cascade following concussive brain injury include abrupt neuronal depolarization, release of excitatory neurotransmitters, ionic shifts, changes in glucose metabolism, altered cerebral blood flow, and impaired axonal function. These alterations can be correlated with periods of postconcussion vulnerability and with neurobehavioral abnormalities. While the time course of these changes is well understood in experimental animal models, it is only beginning to be characterized following human concussion. Following concussion, cerebral pathophysiology can be adversely affected for days in animals and weeks in humans. Significant changes in cerebral glucose metabolism can exist even in head-injured patients with normal Glasgow Coma Scores, underscoring the need for in-depth clinical assessment in an effort to uncover neurocognitive correlates of altered cerebral physiology. Improved guidelines for clinical management of concussion may be formulated as the functional significance and duration of these postinjury neurometabolic derangements are better delineated. Concussion is defined as any transient neurologic dysfunction resulting from a biomechanical force. Loss of consciousness is a clinical hallmark of concussion but is not required to make the diagnosis. Other symptoms include confusion, disorientation, unsteadiness, dizziness, headache, and visual disturbances. These postconcussive deficits occur with minimal detectable anatomic pathology and often resolve completely over time, suggesting that they are based on temporary neuronal dysfunction rather than cell death. Neuronal dysfunction can occur due to ionic shifts, altered metabolism, impaired connectivity, or changes in neurotransmission. Thus, a complete understanding of the phenomenon of concussion requires knowledge of the underlying pathophysiology of this injury. In this article, we will review the neurometabolic events following experimental concussive brain injury and then apply this knowledge to specific scenarios pertinent to sport-related concussion. 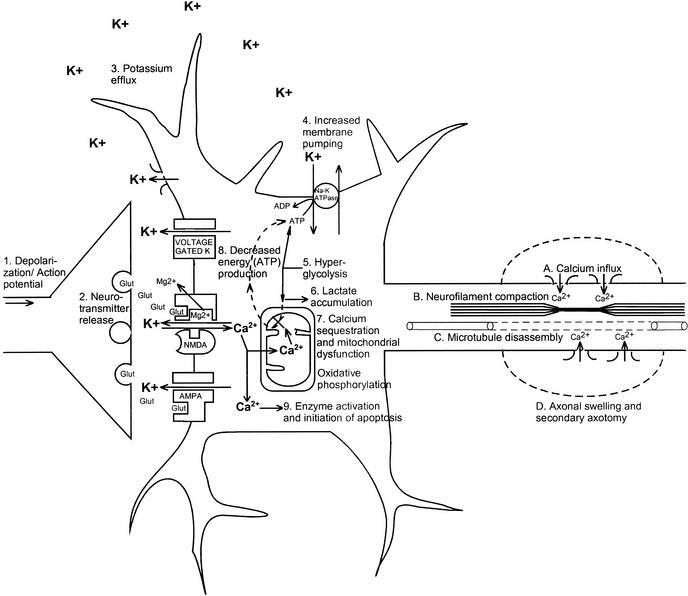 This overview represents a simplified framework of the neurometabolic cascade (Figure 1). Other important components of posttraumatic cerebral pathophysiology include, but are not limited to, generation of lactic acid, decreased intracellular magnesium, free radical production, inflammatory responses, and altered neurotransmission. We will now discuss some of the pertinent details of postconcussive pathophysiology in both experimental animal models and in humans. Figure 1: Neurometabolic cascade following experimental concussion. K+, potassium; Ca2+, calcium; CMRgluc, oxidative glucose metabolism; CBF, cerebral blood flow. (Reprinted with permission. Giza CC, Hovda DA. Ionic and metabolic consequences of concussion. In: Cantu RC, Cantu RI. Neurologic Athletic and Spine Injuries. St Louis, MO: WB Saunders Co; 2000:80–100.). Figure 2: Neurometabolic cascade following traumatic injury. (1) Nonspecific depolarization and initiation of action potentials. (2) Release of excitatory neurotransmitters (EAAs). (3) Massive efflux of potassium. (4) Increased activity of membrane ionic pumps to restore homeostasis. (5) Hyperglycolysis to generate more adenosine triphosphate (ATP). (6) Lactate accumulation. (7) Calcium influx and sequestration in mitochondria leading to impaired oxidative metabolism. (8) Decreased energy (ATP) production. (9) Calpain activation and initiation of apoptosis. A, Axolemmal disruption and calcium influx. B, Neurofilament compaction via phosphorylation or sidearm cleavage. C, Microtubule disassembly and accumulation of axonally transported organelles. D, Axonal swelling and eventual axotomy. K+, potassium; Na+, sodium; Glut, glutamate; Mg2+, magnesium; Ca2+, calcium; NMDA, N-methyl-D-aspartate; AMPA, d-amino-3-hydroxy-5-methyl-4-isoxazole-propionic acid. Normally, excessive extracellular K+ is taken up by surrounding glial cells.5–7 By this mechanism, the brain can maintain physiologic K+ levels after mild perturbations; however, larger insults, such as brain trauma or ischemia, overcome this compensation.8–11 As extracellular K+ increases, neuronal depolarization is triggered, leading to further release of EAAs, opening of EAA receptor channels (NMDA, AMPA, kainate), and still greater K+ flux (Figure 2, event 3). This massive excitation is then followed by a wave of relative neuronal suppression that has been termed spreading depression.12–16 One important distinction between classic spreading depression and postconcussive K+ fluxes is that after trauma, diffuse areas of the brain are affected simultaneously. Early loss of consciousness, amnesia, or other cognitive dysfunction may be manifestations of a posttraumatic spreading depression–like state. Under normal conditions, cerebral blood flow (CBF) is tightly coupled to neuronal activity and cerebral glucose metabolism. After experimental fluid percussion injury, however, CBF may be reduced to 50% of normal.44–47 This posttraumatic decrease in CBF does not approach the 85% reduction seen in frank ischemia48; nonetheless, in a setting of increased glucose use (hyperglycolysis), this mismatch in supply and demand results in a potentially damaging energy crisis. After the initial period of hyperglycolysis, cerebral glucose use is diminished by 24 hours postinjury and remains low for 5 to 10 days in experimental animals.22 Positron emission tomography (PET) in humans shows similar decreases in global cerebral glucose metabolism that may last 2–4 weeks post-TBI.58 In addition, this study found that post-injury hypometabolism did not correlate closely with level of consciousness as measured by Glasgow Coma Score (GCS). Depressed cerebral glucose metabolism was seen in comatose patients as well as in walking, talking patients, suggesting that significant neurometabolic abnormalities may occur in the absence of overt clinical symptoms.58 What is not yet clear is whether this hypometabolism represents a period when the brain is relatively protected from secondary injury or if the brain is more vulnerable because it is unable to respond adequately to further energy demands. It is also unknown whether this depressed glucose metabolism is responsible for more subtle neurocognitive deficits seen after TBI. Intracellular magnesium levels are also immediately reduced after TBI and remain low for up to 4 days.59–62 This reduction in magnesium has been correlated with postinjury neurologic deficits, and pretreatment to restore magnesium levels results in improved motor performance in experimental animals.63 Decreased magnesium levels may lead to neuronal dysfunction via multiple mechanisms. Both glycolytic and oxidative generation of ATP are impaired when magnesium levels are low. Magnesium is necessary for maintaining the cellular membrane potential and initiating protein synthesis. Finally, low levels of magnesium may effectively unblock the NMDA receptor channel more easily, leading to greater influx of Ca2+ and its potentially deleterious intracellular consequences. It is reasonable to hypothesize that diffuse mechanical injury can have lasting effects on the complex sequence of neurochemical and anatomical events occurring during normal development. Indeed, long-term follow-up studies demonstrate persistent neurocognitive deficits after pediatric TBI.103,104 However, it is also difficult to assess developmental deficits in children after mild brain injury, as signs of overt neurologic dysfunction may be lacking, and loss of developmental potential may only be demonstrable at a later time or under specific circumstances. Environmental enrichment provides a useful experimental model with which to study developmental plasticity after brain injury. In an enriched environment, rats are reared communally in a large cage with multiple toys, tunnels, and objects that are changed regularly. When compared with animals reared in standard conditions, enriched rats have increases in cortical thickness, larger neurons, more glia, a greater number of synapses, and enhanced dendritic branching.105–107 The enriched rats are also superior in cognitive testing using the Morris water maze.108 However, when moderately concussed juvenile rats are reared in an enriched environment, they fail to develop the increased cortical thickness and enhanced cognitive performance seen in sham-injured enriched controls.109 These results demonstrate that developmental brain injury, even without early behavioral deficits or significant later morphologic damage, can lead to impaired plasticity. Further studies must be done to determine whether this loss of experience-dependent plasticity is permanent or whether it represents a window of impairment after which the capacity for neural reorganization recovers. As demonstrated by the recent focus on concussion in football and hockey, both athletic trainers and athletes feel significant pressure to return athletes to practice and play as soon as possible after injury. Although returning to play may be delayed because of concerns about susceptibility to a second brain injury, returning to practice might seem like a reasonable means of maintaining physical conditioning while awaiting full recovery. In animals, the importance of limb use in recovery of function after unilateral cortical lesions has been well demonstrated.110 In fact, recovery of function was associated with increased dendritic growth in the homotopic region of the uninjured cortex, dependent on use of the intact forelimb. However, restraint of the uninjured forelimb, and thus forced overuse of the injured limb, resulted in a failure of dendritic enhancement in the intact cortex, an increase in the lesion size in the injured cortex, and a longer-lasting behavioral deficit.111 There also appears to be a time window when the deleterious effects of forced overuse are mitigated to some degree. In the same model, when immobilization of the intact arm was delayed 1 week after the injury, the functional recovery was still delayed, but the increase in lesion size did not occur.112 The results of these studies suggest that, at least after focal brain injury, it is possible to overstimulate the injured brain and that this excessive activation can lead to longer-lasting deficits. How soon to return to play after a head injury and the consequences of repeated concussions are two of the most important health-related issues in sports today. We have earlier reviewed what is known about the neurometabolic cascade of events that occurs after experimental brain injury (Figure ​1). Acute abnormalities include ionic fluxes, indiscriminate glutamate release, hyperglycolysis, lactate accumulation, and axonal injury. Later steps in this physiologic cascade involve increased intracellular calcium, mitochondrial dysfunction, impaired oxidative metabolism, decreased glycolysis, diminished CBF, axonal disconnection, neurotransmitter disturbances, and delayed cell death. It is during this postinjury period, when cellular metabolism is already stretched to its limits, that the cell is more vulnerable to further insults.13 Examining the time course of the post-TBI neurometabolic cascade may help us determine guidelines for vulnerability of the concussed brain to a second injury. Several physiologic parameters indicate windows of potential vulnerability in the traumatized brain. First, consider the period of glucose metabolism-CBF uncoupling. This phenomenon is most dramatic during the hyperglycolytic phase, which, in the rat, begins at the time of injury and lasts for at least 30 minutes.22 At this time, cerebral metabolism is already at its limit, and any further demand in energy (due to increased ionic flux) or reduction in energy (due to impaired blood flow or reduced ATP synthesis) may tip the scale in favor of irreversible neuronal injury. Thus, injured cells may be capable of recovering after an initial injury, but a second concussion during this energy crisis can lead to cell death. After the initial hyperglycolytic period, cerebral glucose metabolism is reduced, as is CBF, apparently resolving the mismatch in energy supply and demand. However, during this period, CBF may be unable to respond to a stimulus-induced increase in cerebral glucose metabolism, reinstating the metabolic crisis. An increase in glycolysis in this period may be due to excessive external stimulation or a second injury (concussion, ischemia, or seizure). Another period of risk may be associated with impaired neurotransmission. Alterations in NMDA receptor composition can persist for up to 1 week after injury in developing rats,84 and a second injury in this period can lead to further impairment of excitatory neurotransmission with a greater degree of cognitive dysfunction. Long-term potentiation, postulated as a mechanism for learning and memory, is impaired for up to 8 weeks after experimental brain injury91 and may be another means by which altered excitatory neurotransmission results in neurobehavioral deficits. Diminished attention and cognition are particularly important in an athletic setting, when subtle impairments will likely increase the risk of recurrent head injury. Post-TBI changes in inhibitory neurotransmission seen in rats95,96 can leave neurons more susceptible to massive depolarization and EAA release after a recurrent concussion. Excessive excitation may then more easily lead to seizure activity, increased energy demand, and possibly further cell death. As each of these physiologic parameters has its own time frame, and each head injury can be very different from the next, it is difficult to definitively state the true duration of vulnerability to a second injury. Preliminary studies using a double concussion model in rats revealed increased anatomic damage and prolonged hypometabolism when 2 concussions were separated by as much as 5 hours.114 Double concussion also appears to increase immunostaining for glial fibrillary acidic protein (a marker for gliosis and scarring) and lead to greater cell loss when compared with a single injury.115 Interestingly, in a recent report, multiple mild concussions preceding a more severe concussion by 3 to 5 days actually resulted in a better functional outcome than an isolated severe concussion.116 However, the anatomic injury appeared unchanged. This finding raises the possibility that after TBI, there is a period of increased danger to a second injury, followed by a period when the brain may actually be more capable of recovering from a repeated injury. Of course, translating these experimental time frames into time frames relevant to human concussion can be tricky. Posttraumatic derangements in glucose metabolism resolve within 7 to 10 days in rats, whereas in humans, persistent depression of glucose uptake has been reported 2 to 4 weeks later.58 Evidence of secondary axotomy is seen as soon as 4 hours postinjury in animals, but evidence of ongoing axonal damage has been reported in human brain tissue even weeks after trauma.75 In general, the time frame for events in rats is much shorter than for similar periods in humans, and it would not be unreasonable to assume that these periods of postinjury physiologic change are longer lasting in humans. In addition, differences in injury type and severity certainly affect the duration of these neurometabolic changes and must also be considered when determining back-to-play status. Cerebral concussion is followed by a complex cascade of ionic, metabolic, and physiologic events. The earliest changes are an indiscriminate release of EAAs and a massive efflux of K+ triggering a brief period of hyperglycolysis. This is followed by more persistent Ca2+ influx, mitochondrial dysfunction with decreased oxidative metabolism, diminished cerebral glucose metabolism, reduced CBF, and axonal injury. Late events in the cascade include recovery of glucose metabolism and CBF, delayed cell death, chronic alterations in neurotransmission, and axonal disconnection. Clinical signs and symptoms of impaired coordination, attention, memory, and cognition are manifestations of underlying neuronal dysfunction, most likely due to some of the processes described above. It is difficult to match clinical signs with specific underlying physiologic derangements, and guidelines permiting return to play only after resolution of all motor and cognitive deficits are a minimal precaution. There is recent evidence that even relatively asymptomatic (GCS 13-15) patients may demonstrate depressed glucose metabolism on PET imaging following TBI, reinforcing the need for meticulous clinical assessment. Further study will reveal more details of the time course for this neurometabolic cascade. This will eventually permit improved clinical monitoring of posttraumatic pathophysiology in actual patients, including variables such as cerebral glucose metabolism, blood flow, neuronal activity, and even molecular changes. Traumatic injury to the developing brain may lead to long-lasting changes in cognitive potential, perhaps even with little evidence of an initial deficit. Children and adolescents who sustain a concussive brain injury should be closely monitored over time for the later appearance of neurobehavioral abnormalities. Repeated injury within a particular time frame can lead to a much larger anatomical or behavioral impairment than 2 isolated injuries. The second injury may be obvious, such as a repeated concussion, hypoxia, or seizure, or it may occur in the form of premature activation or overstimulation of the injured brain. An awareness and understanding of postconcussive pathophysiology will help in determining the best time course for return to practice and return to play. This work was supported by NS37365, NS30308, NS27544, and the Lind Lawrence Foundation. 12. Nicholson C, Kraig RP. The behavior of extracellular ions during spreading depression. In: Zeuthen T, editor. The Application of Ion-Selective Electrodes. New York, NY: Elsevier, North-Holland; 1981. pp. 217–238. 23. Samii A, Lee SM, Hovda DA. 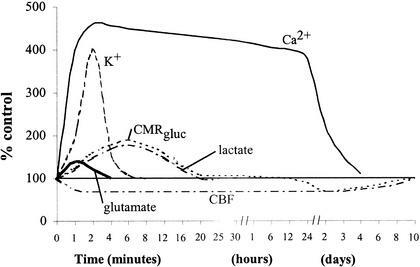 Delayed increases in glucose utilization following cortical impact injury. Program and abstracts of the Annual Meeting of the Society for Neuroscience; November 7–12, 1998; Los Angeles, CA. Abstract 24, 738. 32. Nelson SR, Lowry OH, Passonneau JV. Changes in energy reserves in mouse brain associated with compressive head injury. In: Caveness WF, Walker AE, editors. Head Injury. Philadelphia, PA: JB Lippincott; 1966. pp. 444–447. 42. Becker DP, Jenkins LW. The pathophysiology of head trauma. In: Miller TA, Rowlands B, editors. The Physiological Basis of Modern Surgical Care. St Louis, MO: Mosby; 1987. pp. 763–788. 46. Velarde F, Fisher DT, Hovda DA. Fluid percussion injury induces prolonged changes in cerebral blood flow. J Neurotrauma. 1992;9:402. 47. Doberstein C, Velarde F, Badie H, Hovda DA. Society for Neuroscience. Anaheim, CA: 1992. Jan 1, Changes in local cerebral blood flow following concussive brain injury. Abstract 18,175. 84. Giza CC, Lee SM, Kremen TJ, Hovda DA. Decreased N-methyl D-aspartate receptor (NMDAR) activity after developmental fluid percussion injury (FPI) demonstrated by changes in subunit composition [abstract] Restorative Neurol Neurosci. 2000;16:170. 85. Osteen CL, Giza CC, Hovda DA. Changes in N-methyl D-aspartate receptor (NMDAR) number and subunit composition after fluid percussion (FP) injury appear to prepare the hippocampus for neuroplasticity in adult rats [abstract] Restorative Neurol Neurosci. 2000;16:210. 86. Feeney DM, Sutton RL, Boyeson MG. The locus coeruleus and cerebral metabolism: recovery of function after cortical injury. Physiol Psychol. 1985;13:197–203. 96. Lee SM, Smith ML, Hovda DA, Becker DP. Society for Neuroscience. San Diego, CA: 1995. Nov 8–11, Concussive brain injury results in chronic vulnerability of post-traumatic seizures. Abstract 21,762. 113. Jenkins LW, Marmarou A, Lewelt W, Becker DP. Increased vulnerability of the traumatized brain to early ischemia. In: Baethmann A, Go GK, editors. Mechanisms of Secondary Brain Damage. New York, NY: Plenum Press; 1986. pp. 273–282. 114. Fu K, Smith ML, Thomas S, Hovda DA. Cerebral concussion produces a state of vulnerability lasting for as long as 5 hours [abstract] J Neurotrauma. 1992;9:59. 115. Badie H, Hovda DA, Becker DP. Glial fibrillary acidic protein (GFAP) expression following concussive brain injury: a quantitative study of the effects of a second insult [abstract] J Neurotrauma. 1992;9:56.